Chalkboard wizard. Professor Richard Crandall ’69 knew how to cut through a tangle of equations to the root of the problem. Portland, December 20, 2012, from complications of acute myeloid leukemia. 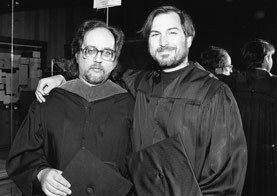 Crandall arm-in-arm with Steve Jobs ’76 at convocation in 1991, when Jobs was honored with the Vollum Award. Richard Crandall defied categories. He was a professor, a physicist, a computer scientist, and an inventor, but none of these labels convey the scope or the depth of his intellectual accomplishments. From the rings of Saturn to the hunt for prime numbers to the circuitry of the iPhone, there was no limit to his curiosity—or to his appetite for discovery. He held 11 patents, authored seven books, and wrote scores of scholarly articles on a vast range of subjects, but his signal achievements probably lay in experimental mathematics—an emerging field he helped to define. Richard was born in Ann Arbor, Michigan, and grew up in Los Angeles. Part Cherokee, he was proud of his Native heritage. His formidable intellect became apparent at an early age; he read Time magazine to his kindergarten classmates during mat time and taught himself calculus at the age of 11. He spent two years at Caltech, attending lectures by Richard Feynman, before coming to Reed in 1967. He loved Reed and often talked of his student days as the most glorious time of his life. He majored in physics and wrote a thesis on some physical manifestations of randomness with Wheeler. In April of his senior year, he made a terrible confession—he had lost his thesis draft at the Lutz Tavern. “He wasn’t terribly concerned,” Wheeler remembers. Always a fast worker, Richard simply rewrote his thesis from scratch and graduated on time. After passing his orals, he revealed that he had also (unbeknownst to anyone) written a second thesis in math, which was approved by John Leadley [mathematics 1956–93]. 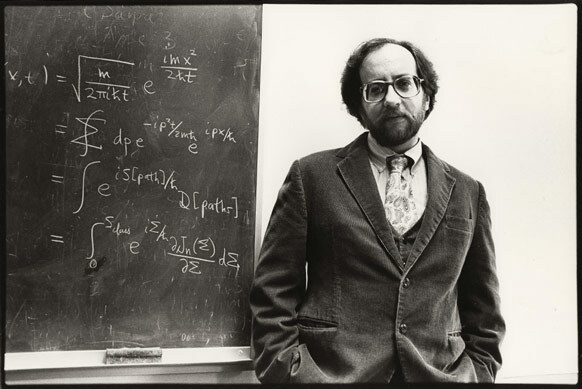 After Reed, Richard went to MIT, where he worked with the theoretical physicist Victor Weisskopf, renowned for his ability to construct back-of-the-envelope estimates based on deft physical insight. From time to time Richard would return to Reed (by train—he hated flying) to recharge his batteries. “We’d work day and night for a couple of weeks on some problem,” Wheeler says. “Then he’d walk me home and we’d stand under a streetlight talking physics until two a.m.” After earning his PhD in theoretical physics from MIT in 1973, Richard designed fire safety and energy control systems for skyscrapers. He was interviewed in People magazine after the blockbuster Towering Inferno about the safety of modern high-rise buildings; the accompanying photograph showed him in elegant pin-stripe suit, vest, and untied tennis shoes. In 1982, Richard struck up a random conversation in the coffeeshop with an alumnus who was talking about computers; this turned out to be Steve Jobs ’76. The two developed a long and productive working relationship. Over the years Richard held several positions at Apple, serving as chief cryptographer, distinguished scientist, and head of the Advanced Computation Group. His algorithms were employed in many of Steve’s legendary projects, including the Macintosh, the NeXT, Toy Story, and the iPhone. He organized Steve’s bachelor party in 1991, and, later that year, presented him with the Vollum Award at Reed’s convocation. Richard continued to teach courses at Reed in scientific computation, work for Apple, write algorithms for his consulting firm, Perfectly Scientific, Inc., and pursue research, publishing scores of papers on subjects as varied as the geometry of the brain and the epidemiology of influenza. He also set up a publishing company, PSIPress, whose catalogue includes books by Marvin Levich [philosophy 1953–94], Julie O’Toole ’71, and Gina Collecchia ’09. He also purchased a print shop, Impress Printing, in NE Portland. 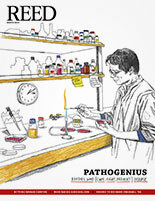 His final project was an “intellectual biography” of Steve Jobs. He was deeply immersed in it in December, when he collapsed at home and was rushed to the hospital, where he was diagnosed with acute myeloid leukemia. He died 10 days later, his great work unfinished. He is survived by his mother, Janice Veca; brothers Gary and Ronald; former wife, Tess; their daughter, Ellen; stepsons Forrest, Eric, and Leif; and nephew Devin Crandall. A memorial will be held on Saturday, January 26, at 2 p.m. in the Eliot Hall chapel.